Welcome to the Create Jewellery Studio. Here you can find out all about the jewellery making classes we offer at our central Middlesbrough base in Platform Arts Studios. We teach jewellery and silver work to those who want to learn a new skill or enhance existing knowledge for personal or professional reasons. We offer a range of short courses, evening classes, taster sessions and master classes in jewellery making and silversmithing. Our jewellery courses are flexible to suit you with half day, evening and weekend sessions and also the option of one to one tuition. Group sizes are small for plenty of individual attention in a friendly, supportive environment. Within our programme you can develop creative ideas, make unique gifts, and learn new skills. We offer traditional goldsmithing for you to produce precious jewellery such as wedding rings, or work with the spontaneity of plastics, textile, or wood. Whether your interests are for steampunk jewellery made from found objects or a traditional craft approach, we can accommodate you. Frances Julie Whitelaw has extensive teaching experience at college and university level and has delivered courses to full and part time students throughout the north east of England. Our studio is equipped with an excellent range of tools and materials for general use at no extra cost. For your design inspiration we have an extensive library of jewellery and silversmithing books. Course fees include basic materials and copper. 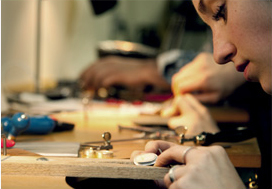 We also provide tool kits and precious metals for sale and can arrange for your work to be hallmarked.